We have we've taken our Aluminum Side Access and Lock Down Ladder Racks and combined them to create the "COMBO" rack. On the curb side of the van you simply turn the handle and the Side Access Rack lowers your ladder to the side of your van where it can be easily removed, frequently if needed. We have we've taken our Aluminum Side Access and Lock Down Ladder Racks and combined them to create the "COMBO" rack. On the curb side of the van you simply turn the handle and the Side Access Rack lowers your ladder to the side of your van where it can be easily removed, frequently if needed. On the street side, you easily turn the handle of our Lock Down mechanism which un-clamps the ladder from the rack which allows you to lift up the end of the ladder, lean it on the extended front removal horn and walk the ladder away from the vehicle. The rotation side of this rack will carry a 120 pound ladder safely while the entire rack has a 500 pound capacity. Racks feature all aluminum construction, stainless steel hardware, non-metallic bushings and are protected by a white powder coat finish. 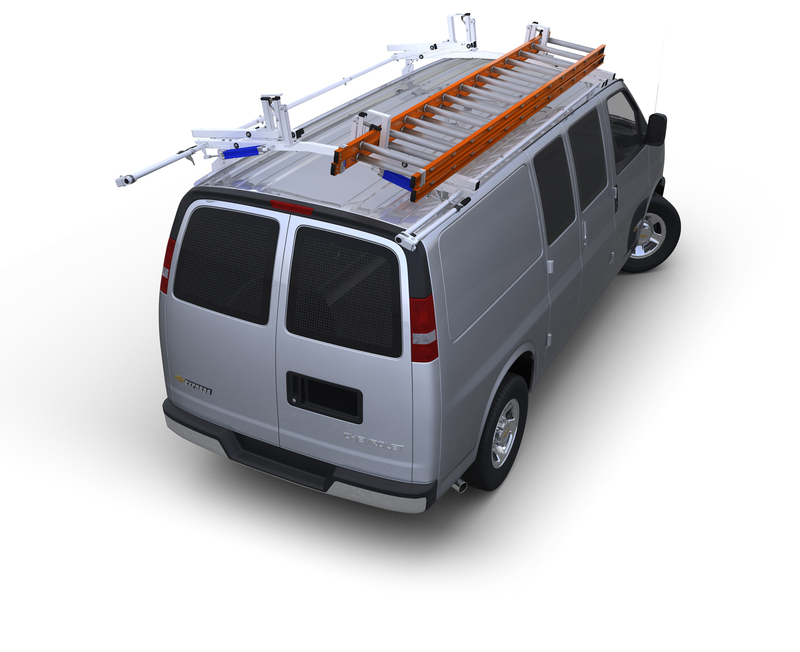 “COMBO” racks are available for all Chevy/GMC, Dodge and 2014 and older Ford full sized vans. Call for other vehicles. Please select the correct rack for your vehicle from the options above.